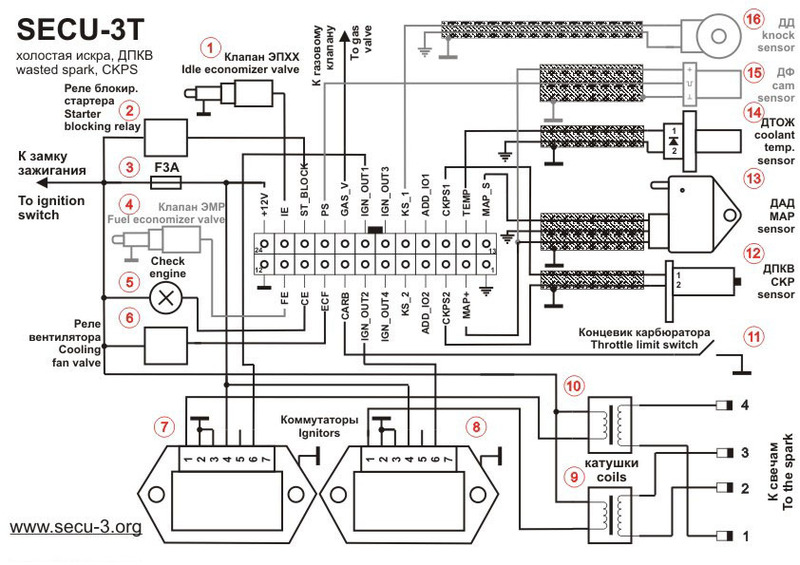 Minimal wiring diagram with using of distributor and synchronization from hall sensor. 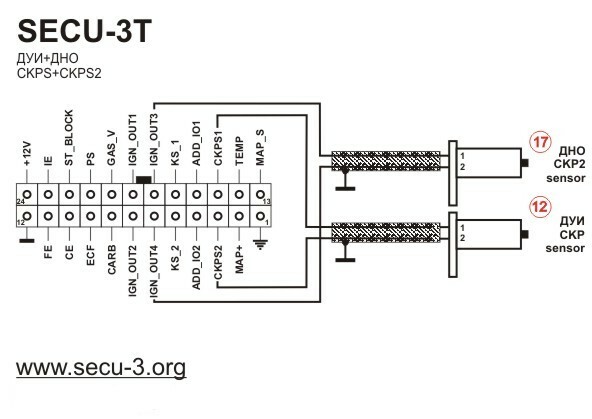 Minimal wiring diagram SECU-3T unit. Synchronization from a VR type CKP sensor. Simultaneous or semi-sequential injection, Hi-z injectors, stepper IAC actuator. 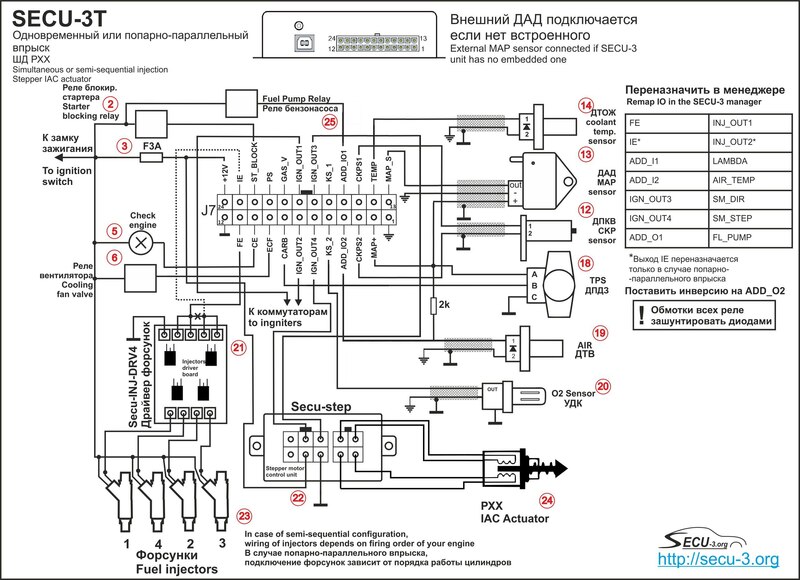 Hi-z injector driver board and stepper motor control unit are used. Idle cut-off valve, installed on carburetor, for instance, 2108-1107420 (Solex). Power valve, has to be installed manually on the caburetor thus replacing old spring and diaphragm, for instance, 2108-1107420 (Solex). 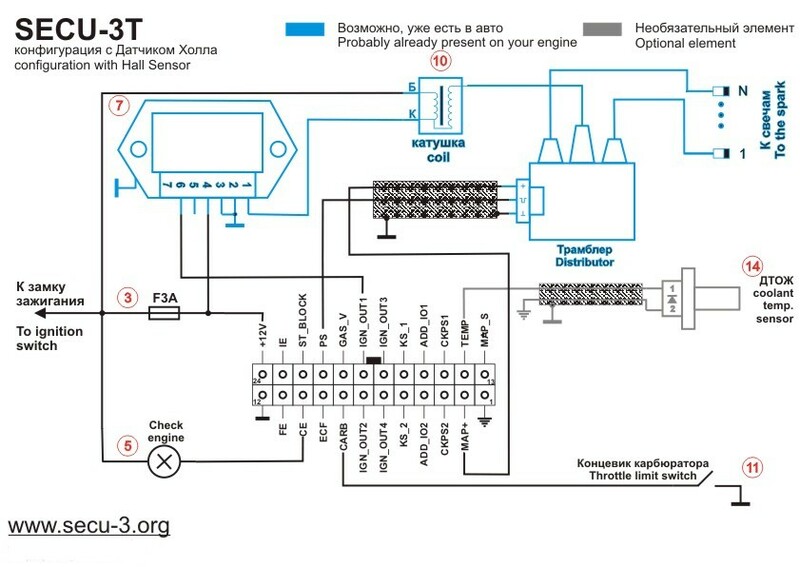 ‘Check Engine’ lamp, 12V and no more than 5W. 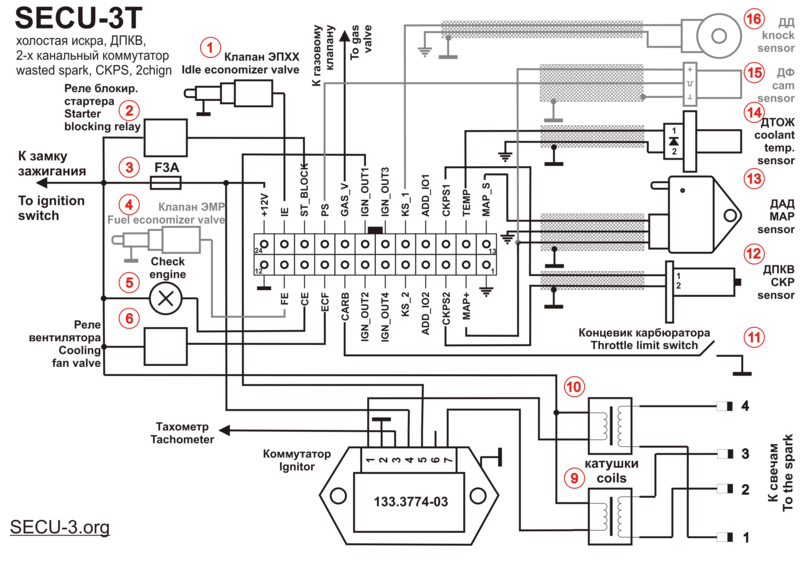 Twin ignition coil, for instance, 406.3705. Crankshaft position sensor, for instance, 191.3847. 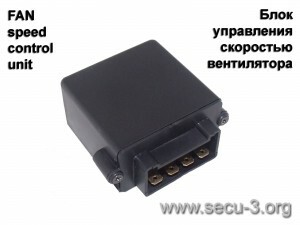 MAP sensor, for instance, MPX4250, Bosch 0 261 230 004 or other. 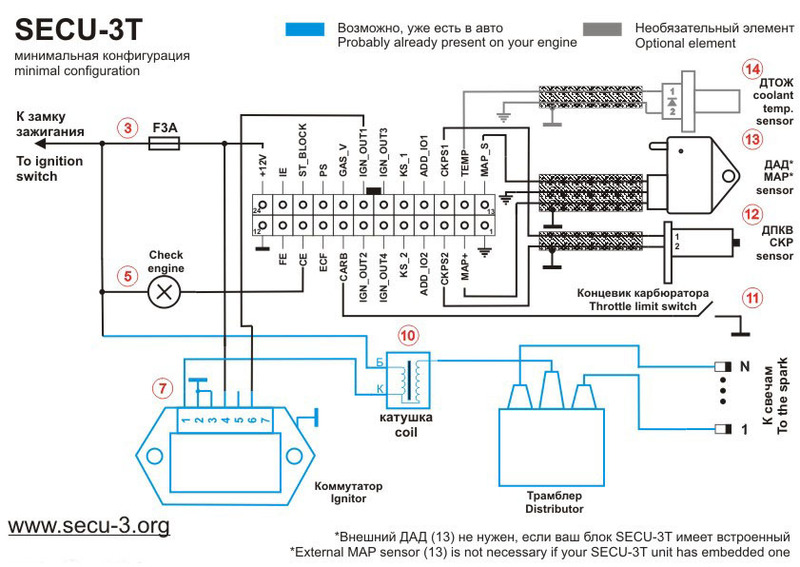 Coolant temperature sensor, for instance, 19.3828. Camshaft position sensor, for instance, 141.3855 or Hall Sensor A473.407529.001 (when retrofitting distributor for using it as cam sensor). Knock sensor, for instance Bosch 0 261 231 176. Diagrams depicting connection of high voltage tachometer for cases with different number of coils. Diodes are used for ORing of high voltage signals. 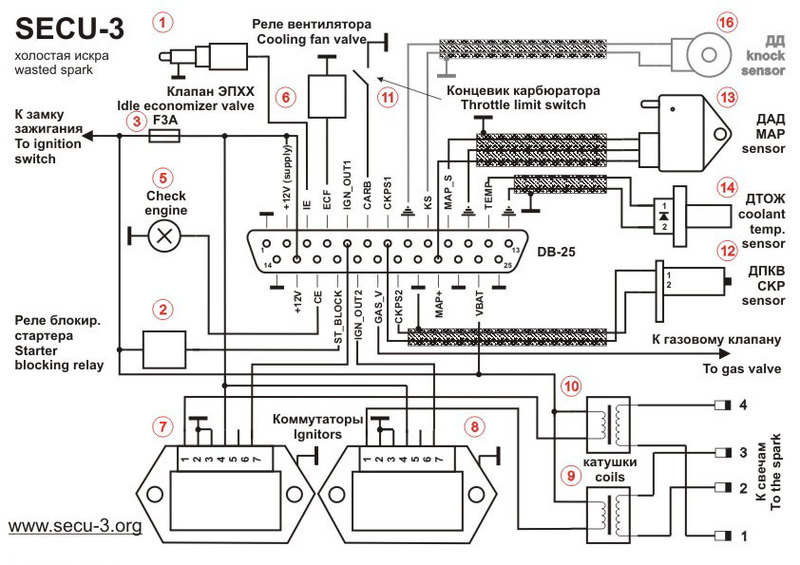 VT4, VT5 transistors can be installed without radiators. Inductance L1 for example can be RCR1616NP-4R7 , you can also use a piece of ferrite with permeability of 400, D=10 mm, L =30 mm with reeled wire D=1.2 mm. Parameters of the inductor are not critical. You can buy already made fan control unit. Схема подключения МПСЗ SECU-3 при синхронизации от датчика холла трамблера.не могу найти прошивку под эту схему подключения.можно ссылку.зарание спасибо.